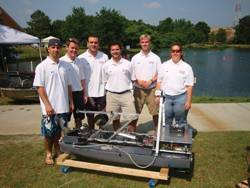 The theme of the 4th International RoboBoat Competition, sponsored by The Association for Unmanned Vehicle Systems International (AUVSI) Foundation and the Office of Naval Research (ONR), was “The Four Elements.” Teams of students designed and built autonomous surface vehicles (ASVs) that faced challenges involving earth, air, fire and water. The teams were judged on both design and performance. Prior to the competition, each team had to submit a journal paper and website for evaluation by the judges. Teams are judged on the utility of the website. The journal paper describes the vehicle design and the rationale behind the design choices. From the journal paper, teams are judged on technical merit and written style. Each vehicle is brought before the judges and during this static display time judges, the general public, the press and other organization representatives listen to a presentation from each team, ask questions and view each boat up close. The team is then judged on technical accomplishment, craftsmanship and even their team uniform. Discretionary static points are awarded after the static judging. The performance portion of the judging took place out on the course. Each boat is weighed right before going into the water. 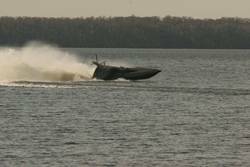 After a thrust test, the vehicle begins its autonomous journey by heading in a straight line through the first set of buoys known as the “starting gate.” The boat then heads toward the second set of buoys called the “speed gate,” with the goal of getting from the starting gate to the speed gate in the shortest amount of time. The vehicle must also navigate through sets of red and green buoys while avoiding “obstacles” represented by yellow buoys. A blue buoy marks the end of the channel and the start of the four advanced tasks known as “The Four Elements,” representing earth, air, fire and water. The earth task involves getting the boat to perform a task on the ground; in this case, retrieving a ball from a platform set out of the water. This can be accomplished by either sending the craft up a ramp or by using something from the boat to pick up the ball and take it with them. The air task involves some serious problem solving. The boat approaches a set of four metal plates with logos on them. Behind each plate is an electric heater, but only one of them is actually on. The boat has to determine which plate is live and this information is sent from the vehicle, back to the judges. The fire task involves putting out a simulated fire. The boat uses its on-board water cannon to squirt water through a hole in the sign marked as a 'burning' boat. By filling the cup on the other side of the sign, a flag comes up to simulate that the fire is out. As the boat approaches a make-shift water fall for the water task involved, the boat must get under the spray and press the stop button to turn off the water. If the boat isn’t watertight, the water will disable the craft. Each boat must be complete with GPS and/or a navigation system, a camera, a propulsion system, a computer and be water tight to stand the rigors of the competition. Teams were judged on ship design and performance. A team can consist of a combination of faculty, industrial and/or government partners and high school, undergraduate and/or graduate students, although full-time students must compose at least 75% of each team. Other teams entered were Cedarville University, Embry-Riddle University, Florida Atlantic University, Old Dominion University, Villanova University and Virginia Tech. This was the second year for National Cheng Kung University, Taiwan and, despite the language barrier, did an exceptional job of presenting the best paper. But the Dark Horse of this year’s event was definitely the team from Diponegoro University, Indonesia. The Diponegoro University Team, all students of naval architecture, came across the RoboBoat Competition while surfing the internet. They quickly realized that this was a competition that they could not ignore. They built their boat in 30 days using any and everything they could find lying around. They also found a sponsor in addition to the University’s support, and obtained visas a mere 5 days before the start of the competition. Upon landing in the United States, they were not allowed to bring in certain parts of their boat. Undaunted and with the selfless help of the U.S. Naval Academy, the Diponegoro University team was able to replace those missing parts from Radio Shack. After the awards dinner, the team was headed to Washington, DC to meet with the Indonesian Embassy. They were looking forward to being in our nation’s capital, to visiting the Indonesian embassy and seeing and having their pictures taken in front of the White House. Despite the language barrier, these young men are a source of inspiration to all they encounter. I expect to see more of Diponegoro University at future competitions. The goal of Navy STEM programs is to increase the talent pool of future Sailors, naval scientists and engineers. STEM enables the success of naval missions and protects the live of Sailors and Marines. The SeaPerch Program is funded by the Office of Naval Research (ONR) as part of the National Naval Responsibility for Naval Engineering. SeaPerch is a remotely operated vehicle (ROV) and an underwater robot that students build from a kit. 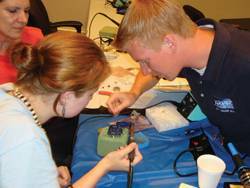 As part of the SeaPerch program, teachers are trained to build their own SeaPerch. They then go back to their schools and teach their students. The SeaPerch program is now in 38 of the 50 states as part of the curriculum or as an after school program. Student teams participate in regional challenges and this year marked the first National SeaPerch Challenge, held at Drexel University in Philadelphia, PA. The earlier we can introduce young students to robotics and engineering, the better chance we have of building a competitive team of engineers for America’s future. 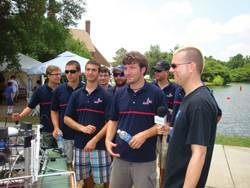 “I did robotics in high school and I think that program was a great program. I think that programs like that were very helpful. We had a math and science program and they did a thing on robotic arms with a space program and we got to go look at how those worked and learned about basic math in middle school,” said Janine Mask of the Florida Atlantic University Team. For a few hours on Saturday, June 11th, you could see these robots in action at the Founders Inn pool operated by middle and high school students. Grace Magdamo, niece of Susan Nelson of the Society of Naval Architects and Marine Engineers (SNAME) and Education and Outreach Director of the SeaPerch program, built her SeaPerch in the sixth grade and is now a high school student at Watkins Mill High School in Gaithersburg, MD. Last summer, Grace attended GEMS (Gains in the Education of Mathematics and Science), a U.S. Army K-12 program, where she learned more about robotics. “It was a lot of fun exploring the areas of engineering. We did biology, we dissected a sheep brain. And it was programming robots to move around a chair. It was a sprinkling of everything.” More and younger women like Grace are pursuing careers in engineering, thanks to programs like GEMS, SeaPerch and the efforts of the AUVSI Foundation. There was also a teacher training class for local teachers facilitated by Susan Nelson and Toby Ratcliffe, Research Hydrodynamicist, Naval Surface Warfare Center Carderock Division and Educational Outreach Coordinator, National Defense Education Program (NDEP) Pre-Engineering Program. Teachers all over America are looking to programs like SeaPerch as a way of getting their students to see the wonderful benefits of science, technology, engineering and mathematics in the real world.